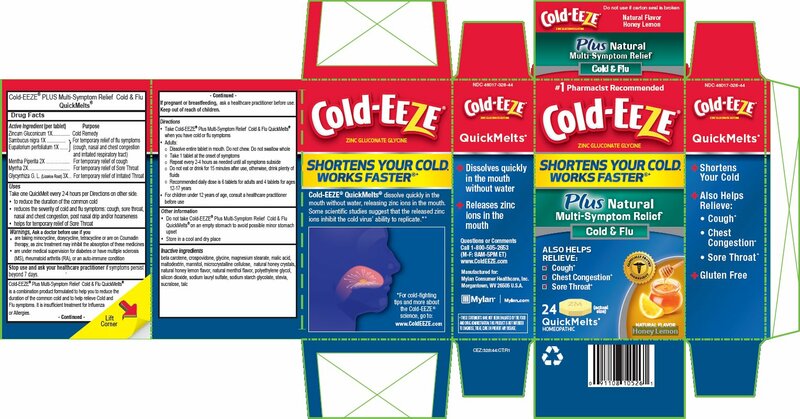 Proprietary Name: Cold-eeze Natural Multi-symptom Relief What is the Proprietary Name? Non-Proprietary Name: Zinc Gluconate, Sambucus Nigra Flower, Eupatorium Perfoliatum Flowering Top, Mentha Piperita, Myrrh, And Glycyrrhiza Glabra Leaf What is the Non-Proprietary Name? Cold-eeze Natural Multi-symptom Relief with NDC 46017-328 is a a human over the counter drug product labeled by Mylan Consumer Healthcare, Inc.. The generic name of Cold-eeze Natural Multi-symptom Relief is zinc gluconate, sambucus nigra flower, eupatorium perfoliatum flowering top, mentha piperita, myrrh, and glycyrrhiza glabra leaf. The product's dosage form is tablet, orally disintegrating and is administered via oral form. If symptoms persist beyond 7 days.Cold-EEZE® Plus Multi-Symptom Relief Cold & Flu QuickMelts® is a combination product formulated to help you to reduce the duration of the common cold and to help relieve Cold and Flu symptoms. It is insufficient treatment for Influenza or Allergies. Ask a healthcare practitioner before use.